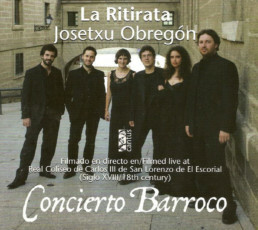 Recorded in concert at the Real Coliseo Carlos III, the small baroque theatre built for the pleasure of the Court of the Royal Site of San Lorenzo de El Escorial. Hailed by the audience that filled the small Escorial theatre, La Ritirata offered on 28 May 2011 a beautiful concert of works from the seventeenth and eighteenth centuries, in a musical journey that started with the delicious dances of Andrea Falconieri, then introducing his contemporaries Selma and Castello to arrive to central baroque composers rarely visited as Paisible, and the universally familiar Vivaldi and Telemann. BARTOLOMÉ DE SELMA Y SALAVERDE (C.1580-C.1640). Total playing time 1h 21 min. Grabado en directo en el Real Coliseo Carlos III, el pequeño teatro barroco construido para solaz de la Corte del Real Sitio de San Lorenzo de El Escorial, el 28 de mayo de 2011.